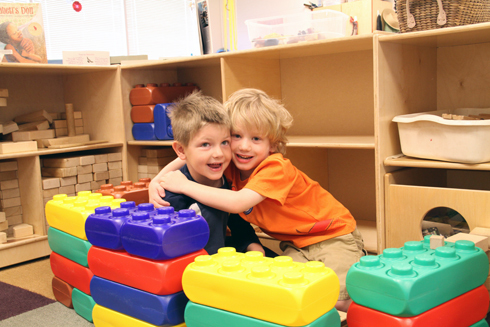 Best pals Jonah, left, and Riley, right, hang out in the new kindergarten classroom at FACE Center. Fifteen classrooms were designed for the CDCLS. 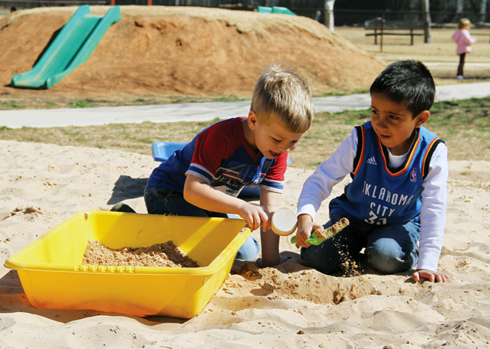 Ethan (left) and Jauquin (right) play in the sand at the new Child Development Center and Lab School located at FACE Center. Other programs at the FACE Center include the Summer Kids Camps for students in grades first through eighth, and adult personal enrichment classes that allow adults to learn dance, language, computers, driver safety and music. Betsey (left) and Brianna (right) climb through the tunnel in the new Child Development Center’s infant and toddler room at FACE Center March 23. 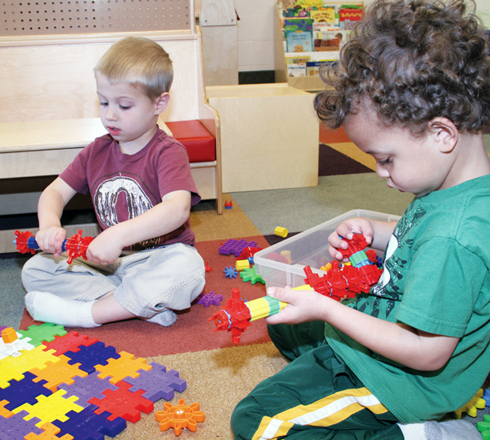 Jacob(left) and Ayden(right) enjoy building during class time in the pre-school room at the new Child Development Center at FACE Center March 23. Quadruple the classrooms, an all-natural playground, and on-site security are just a few of the amenities to be had at OCCC’s Child Development Center and Lab School, recently relocated to the new Family and Community Education Center at 6500 S. Land Avenue. In its former on-campus location, teacher Lisa Jones said, the CDCLS had cramped office quarters and only three classrooms. Now, she said, 67 children between the ages of six weeks and 8 years occupy 12 classrooms in the facility, with an additional three rooms available if enrollment expands. In addition to an on-site security office that allows for quick response should an emergency arise, Jones said, one of her favorite new attractions is the playground. 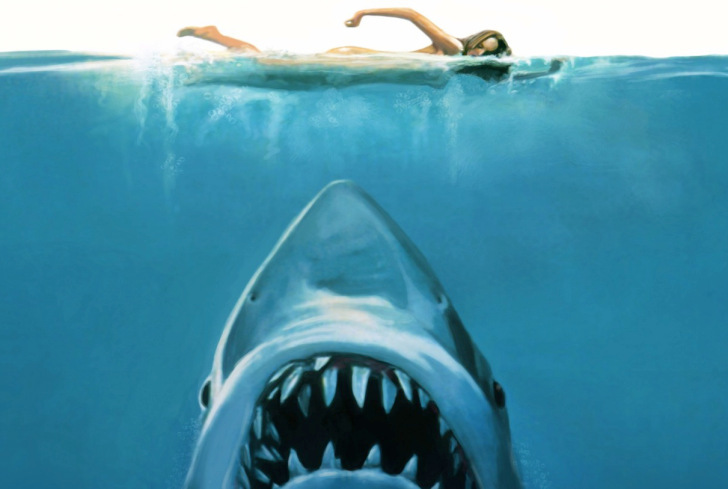 “It’s an opportunity for them to experience nature in nature,” Jones said. Among the playground’s new features are a cement bicycle path, a wing-shaped butterfly garden, and a small dirt mound affixed with plastic slides that children can climb and slip down. Jones, who has worked with the CDCLS for 15 years, said she is thrilled with the move. “It’s by far the most positive thing that’s happened since I’ve been here,” she said. Teacher Constance Pidgeon said the facility’s littlest occupants are just as excited about the move as her fellow instructors are. Rhianna, 5, said she likes the new facility better than the old one. “I like it here,” she said.